Is there any way to tell when the 4.4 release will take place? Well, it's open-source, so there's no hard guarantee :) It ships when it ships ... but, generally we've been doing .x releases every few months. You can also easily build the Lucene JARs off a 4.x branch checkout. Hi, Michael, how are you doing? I am particularity interested in the feature of Dynamic range facet. I am wondering do you know any resource that have examples of how to use this feature? We have a requirement where we need to display facet for price range. Firstly let me explain our data structure. We have products and product will be present on multiple stores and each store has it's own price. Now the requirement is, when customer is logged in price displayed should be from selected store and challenging part is how to show price range facet according customer's selected store in search results page. Let me give an example, we have Product-P under Store-A, Store-B with prices 8$ & 12$ respectively. Assume user-1 selected preferred store as Store-B then the Product-P will have price 12$ and same way for Store-A price will be 8$. So, Product should be shown under 0-10$ price range if user selects Store-A else it will be under 10-20$ price range for Store-B. So what is the best approach to index data into SOLR search engine so that price facet range can be handled effectively. We can think of one approach, where we can index all individual store price for each product and each store price as individual attribute. If product present under 40 stores then number of attributes will be around 55 attributes (including basic attributes) which is huge i think. So please provide your valuable suggestions & thoughts. Could you email solr-user@lucene.apache.org with this question? WDYT about hacking SortedSetDV codec to dedup text values, map to global ords and write global ords to file? The challenge there is that the Codec API is strongly per-segment. This is what the taxonomy index does in Lucene's facet module, so that at search time we do all counting in the global ord space. For SortedSetDVFacetCounts, we create the OrdinalMap which computes the local -> global ord mapping for each segment. 2. is clear, but you know. 3. is it a cool thing or it's worth to move it to index-time, and we just need to find how exactly to do so? - then when we index segment 2 with terms B,D. - in the second pass we can remap them to global ords: B->2, D->4. - the only additional data structure we need in query time is max(global-ord) -> segment. where we can find segment with particular term when we doing 'labeling' (map globord to text). this data structure is compact and incremental. - we've lost sortability definitely, and feel some pain during merge. However, this usecase seems useful for me. Do I miss something? I think something along these lines should be possible :) It's just software! On seeing a new segment, in the worst case, you'd need to go and rewrite all prior segments, right? (E.g. a new segment may insert a new label as globalOrd=0, and bump all past globalOrds by 1). The taxo index avoids this because the ords are not actually ords, they are "term ids", assigned first come first serve. So new labels won't change any previously assigned ords. One nice property of this approach is that the common labels tend to get smaller ords = less storage since we use delta vInt encoding to write the ords for each document. hm. I see my example is not representative enough. My idea is that we can lose ordering of ordinals. documents with B,D,E obtains global ords 1..3 from segment mapping. We can't sort by these ords, but faceting should be really NRT, and memory cheap. Idea of taxo index is clear to me. OK, now I see. So you want to assign term IDs, not ords (just like taxo index), but instead of storing the mapping separately, like taxo index does, you want to do it as a clever DVFormat, which would be awesome. So the DVFormat would somehow "see" all existing segments mappings (I guess load & union them on init), and then only write any new labels to the current segment. Why would merging be hard? It seems straightforward? Unless you want to try to "garbage collect" any now-unused term IDs, which would indeed be hard; I wouldn't try to do that on the first go. Using numeric doc-values, dynamic faceting over numeric ranges is possible. Is there some way when faceted search is executed, we can retrieve the possible min/max values of numeric doc-values field with supplied custom ranges or some other way to do it ? As i believe this can give application hint, and next search request can be much smarter, e.g custom ranges can be more specific ? I don't think Lucene has such auto-ranging built in today, and it would be a nice feature to add. You could make a custom RangeFacetCounts whose only purpose is to gather min/max/other stats, run with that, then pick "good" ranges, then run again? 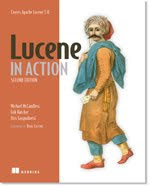 Try asking on java-user@lucene.apache.org too; maybe others have good ideas. Have a look at how Lucene's unit tests do this? Or, the facets examples in the demo module? I have a scenario where we need to add hierarchial attributes to a document after it has been indexed. The problem is that these attributes are not know during indexing. I understand that, only way to add information to a document after it has been index, is to update an existing DocValue field. Can somebody tell if there is a way to use the DocValue field information to build hierarchial facet? I have a requirement where I want to perform the dynamic range faceting for the indexed numericDocValues Field (say: "price", "salary"). In Lucene, SSDVFF supports drillsidewayssearch which retain the previous level facets and counts. Like SSDVFF, I need to retain previous level numeric range even after selecting any of the numeric field's range. Is Lucene support drillsideways search for dynamic range faceting internally like SSDVFF...? How can I achieve this??? Kindly provide your valuable suggestions & thoughts. Hi Chitra, yes Lucene should support this, and I thought we iterated on this already on the Lucene users list and you got it working? ya, I remember it mike. we are digging deep into it. We need some clarifications regarding that. 1.In earlier version like lucene-4-10-4(we are using) multi-faceting for a numeric field is not working while adding it on drilldownQuery. And in later version 6.4.1 it was supported... We try to reuse this class in 4.10.4 version. But the class was declared as final. why was it (DrillDownQuery class) defined as final? Any specific purpose? 2. If we can override buildFacetsResult method in DrillSideWays (for numeric or multi-numeric faceting), then why can't we override drilldownquery for multi-select faceting?? Both the classes are inter-connected.